For many households, the days of living in a home with three bedrooms and a garage on a quarter-acre block are gone. The need to live within a one hour commute of the city for work and/or social life has led to an uptake in apartment living. This lifestyle has its benefits, but also its disadvantages, such as having less readily available storage space. Rooms will be of a smaller size, and you may have swapped the garage for a communal parking spot. However, this does not mean you need to put your snowboard, book collection and children’s toys on Gumtree. We show you some clever storage ideas for small houses. Storage for smaller items, such as books, wine bottles, photos and pot-plants does not need to look like clutter, it can be integrated into a feature. The wall niche is a throwback to classic ancient roman architecture, which can be integrated into the homes of today. A series of wall niche’s which sit inside the wall can add style to the room and utilise space above the couch or next to the dining table, which would not have been used anyway. A Wall Niche or even external shelves can be used to surround a doorway, adding creating an archway-look while using space in a clever way. This can be useful for storing plates and glasses in the kitchen or towels and shaving cream in the bathroom. Often people will have a cupboard underneath the staircase, however, those who have walls on both sides do not have this option. 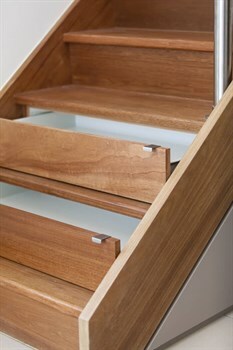 Stairs are a wasted resource for home storage and can be used to hold drawers for storing bed sheets, toys, books and shoes. One room that begs for clever storage solutions is the kitchen – things can get cluttered very quickly if convenient storage is lacking. Ease of access is important - many don’t fully utilise the space in kitchen cupboards because it is difficult to bend over and reach items at the very back. One solution is to create slide-out storage options that can be pulled out, provide easy access to frequently used items such as spices and sauces, and pushed back in when the cooking is complete. 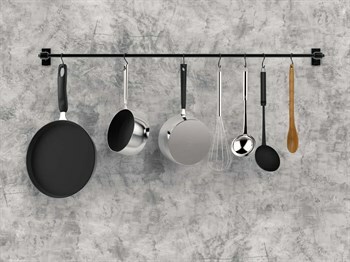 These can be made to fit your kitchen so when they are pushed back in, you wouldn’t even know it existed! 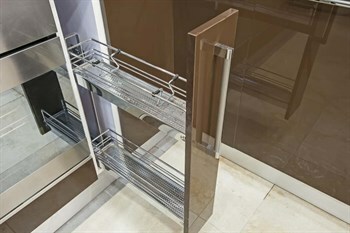 There are also pantry storage solutions that will maximise storage potential. Often the back of the door is not used, wasting space where shelves or hooks could be placed. Placing hooks above the benchtops can be a great way to free up space in the pantry or drawers, keep important utensils close and can prevent damage to non-stick surfaces by preventing stacking. In your house, what would be the least utilised room in the house? The laundry? If something has to be sacrificed to create more space, then this is most likely the only room you can live without. 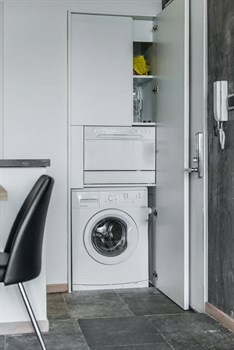 Many space-savvy apartments are implementing a ‘European-Style’ laundry, which involves neatly storing the washing machine, dryer and sometimes a sink in a large cupboard. This cupboard could be in the hallway, bathroom or kitchen – wherever suits your home best. Are you keen to add more storage and create more usable space in your home? Have a friendly chat with Triple O Property Maintenance to find out what storage solutions can be added to your home.